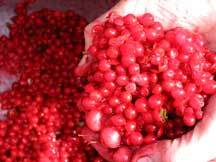 These bright red berries can be collected throughout October. Cut the bunches of berries from the plant just above the final bud on the branch. 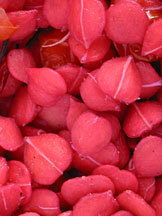 Berries can be stored in buckets for a week or two provided they are kept in a cool, dry place. To extract these seeds you need a bucket or two, a flat-bottomed pole (for example, an old sawn-off spade handle), a sieve or colander and access to a hosepipe or water supply. The berries are mashed and the waste and seed separated through the sieve. For a more complete description click here. Guelder rose seeds exhibit a peculiar kind of dormancy. Mix the extracted seed with a mixture of peat-free compost and horticultural sand (50:50 will do). Choose a pot large enough to accommodate this mixture and a bit more. Place some stones on the bottom for drainage with a thin layer of sand on top. Add the seed/compost mixture and another layer of sand to finish. Place the pot outside in a shady place and leave until the following May. Don’t forget to label! At the end of May they will be ready to sow. In a 1-litre pot sow three seeds and cover with 10mm of compost or grit. Firm gently and water. On a seedbed broadcast the seed quite densely – aim for about 5mm between seeds. Firm with a board or roller to press the seed well into the soil. Cover with 10mm of grit. 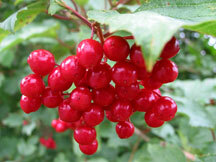 Keep guelder rose seed moist at all times. Your seeds will soon begin to germinate and grow, but you won’t see anything for a while (until next April in fact!). For the next few months through the summer, the seeds will grow a root about 30-40mm long. Keep well watered. The seeds need another period of cold (the following winter) before the leaves will begin to grow. Leave the pots outside! During the spring, you’ll begin to see the young leaves emerge. The plant will grow like any other from now on. During this second summer, you can transplant the seedlings to give them more room to grow. They will probably need to be left for another full year before they are ready for planting out. Prepare the site well by clearing away any weeds or grass and make a hole big enough to accommodate the root ball. Plant carefully in the hole, to the same depth as it was growing previously, and firm back the soil.